The last time we saw Scuzzball, he was picking up Sister June at the cathedral. He was playing it all cool then, but apparently he is tormented by his doomed love for her. Oh, the angst! 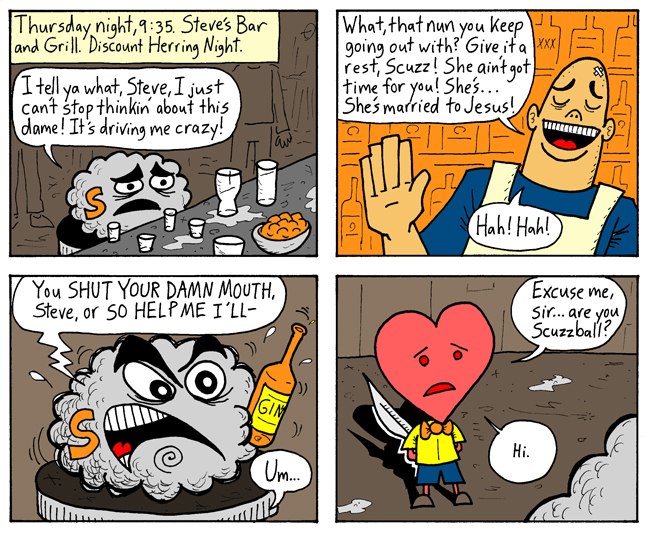 The heart-headed guy is Michael of the Love People, a character created by D.F. French about 20 years ago. Steve the bartender makes his first appearance here. Next Week: The demonic invasion continues! Just got through the archives. This is one of the BEST comics on here man!! I laughed out loud so many times. Great comic!! I can't wait for more. Your characters are freaking awesome! Okay I'll stop yelling! !